The once sleepy, off-the-beaten path Lovettsville is increasingly a speck in the rear-view mirror, giving way to a vibrant new business scene. Recent retail developments, which have brought several new businesses to town this year, is changing the look and tenor of the community first settled by German immigrants nearly 300 years ago. Lovettsville has a population of 1,800, with 6,000 more residents scattered throughout the 20180 ZIP code area. The municipality has long held a reputation for being business friendly, harboring home-based businesses producing such things as beef jerky, home-made macarons, and hand-crafted soap. The town also hosts George’s Mill Artisanal Cheese, a farm-based operation making gourmet goat cheese popular with local wineries and restaurants, some of which are located just outside Lovettsville’s borders. The town is also home to two popular, long-time restaurants enjoying over 20 years of success: Bonnie’s Country Kitchen on the Berlin Turnpike; and Lovettsville Pizza & Subs in the Old Town sector. The Lovettsville Cooperative Market, which is set to open a full-service grocery store within two years, also hosts a summer and fall farmers’ market. The town also has well-established businesses offering dental, veterinarian, and hair salon services. However, the latest Lovettsville business activity is ratcheting up to an unprecedented level. At the core of that surge is the Lovettsville Town Center development. After years of sometimes contentious government wrangling and economic ebb and flows, commercial developer NV Retail is gaining momentum leasing space at Lovettsville Square, its 17,500-square-foot, boutique-like retail structure on the west side of the Town Square. It was designed to look like a building one might find in a traditional German village, featuring a distinctive clock tower that illuminates at night. This project is a relatively small one for NV Retail, which mostly focus on large retail centers that incorporate big-box stores like Costco and Target. But in a major score for Lovettsville and NV Retail, the Purcellville-based chicken wing purveyor and sports-themed family restaurant, Velocity Wings, recently laid claim to the south corner of the new building. In addition to serving typical sports bar fare such as wings and burgers, the establishment will also have a full-service, sit-down bar, a first for the town. Velocity, which also has establishments in South Riding and Bristow, and one planned for Manassas, is expected to open its doors this fall. This bustling commercial activity is no surprise to Town Council member Jim McIntyre, who’s serving his second term after being first elected in 2012. He says it’s all part of Lovettsville’s strategic community growth plan, developed by the Town Council five years ago when Bobby Zoldos was first elected mayor. 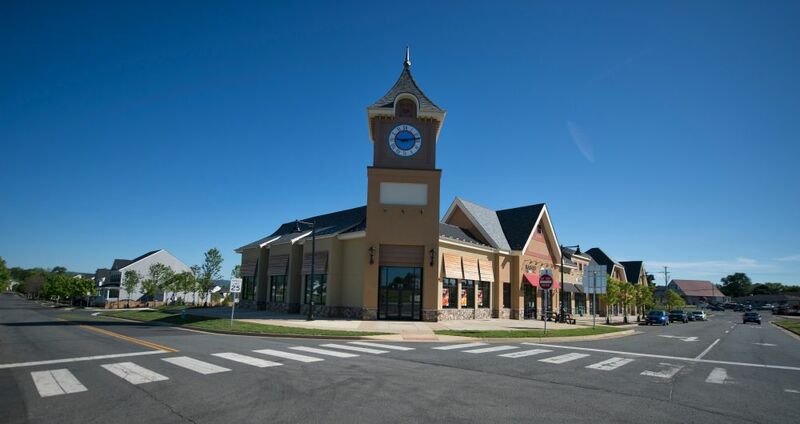 The town government has long sought to establish a retail-based town center, providing residents and visitors convenient, walkable access to businesses. Lovettsville Square, completed last summer, was first anchored by the Leesburg/Sterling Family Medical Practice, quickly followed by Palmercare Chiropractic. 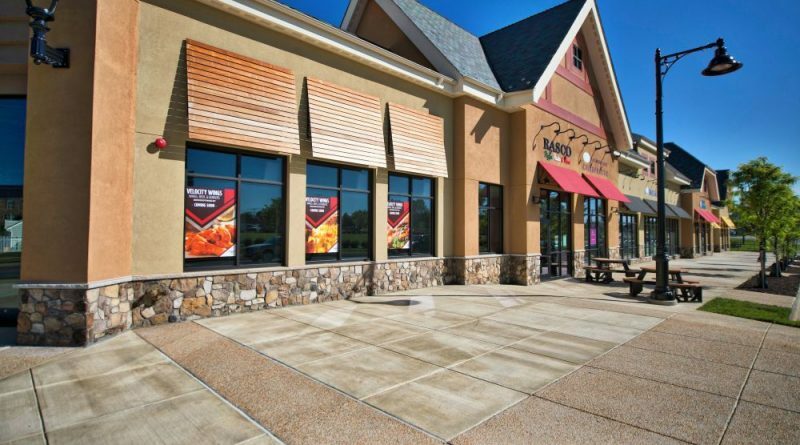 This year saw the addition of MT Nails & Spa, and the pizza and pasta purveyor, Rasco New York Pizza, which operates five pizzerias in Virginia, Maryland, and West Virginia. McIntyre said this recent growth represents dividends from the town’s focused strategic plan and strong town government leadership, including from Town Manager Laszlo Palko, who came to Lovettsville in 2014. McIntyre attributes recent business recruitment success to Palko’s focused, energetic promotion of the Town at regional conferences and within the local business community, while also managing Lovettsville’s considerable residential growth. But organized community events also loom large in town efforts to market and brand Lovettsville. McIntyre, for example, oversees the town’s annual three-day Oktoberfest festival, which has grown from a relatively small event to one drawing 10,000 people each September. The town also holds numerous public events throughout the year, including a MayFest celebration, a popular summer movie and concert series held on the Town Green at the Walker Pavilion, and a New Year’s Eve 5K run features the infamous town “Squirkle,” the square roundabout-type intersection in the town center. “Lovettsville wasn’t graced with some of the features that typically draw tourists, but what we do have is some great restaurants and a community of incredible people. The simple idea was to actively use our year-round calendar of events to showcase the Community and show our visitors what we have to offer, with the hopes that they would want to return,” McIntyre said. “In the last five years, meal tax revenues have increased by 140 percent, which is all slated for infrastructure and economic development projects—things like building sidewalks that will allow our residents to walk to our restaurants,” McIntyre said. He points out these numbers don’t yet reflect revenues to come from Rasco Pizza or Velocity Wings. In addition to the steady pace of activity at Lovettsville Square, McIntyre noted there are other signs of business development throughout town. There is local buzz about a possible beer garden, serving local wines and beer in an outdoor setting up in the recently closed Farm Store adjoining Bonnie’s Country Kitchen. A coffee shop is being built-out in a former residence on East Pennsylvania Avenue, near Town Hall. And Lovettsville resident Joe Brower is planning to open a “gastropub” in the recently closed Mad Horse Brewpub space. And Thaiverse, which opened on East Broad Way in 2015 continues to draw raves as one of the region’s top Thai restaurants. Add to all this hubbub is a new community center, a large community park and a rebuilt 7-Eleven store with a German architectural style, and a comfortable bicyclist pavilion. McIntyre said it is part of the town’s long-term vision to make Lovettsville a conveniently walkable community. Loudoun County economic development leaders agree the town has great potential as a western Loudoun commercial hub. Hinkle said other state officials often express amazement about Loudoun’s sustained economic growth, including in Lovettsville. She said that Maryland business owners, in particular, see what’s going on and question why they can’t achieve similar success. She tells them it’s all about town and county leaders making it as easy as possible for businesses to open and thrive, then to consistently support those efforts. Hinkle says Lovettsville fits that bill. Most residents seem positive about the changes within town, if postings on social media sites such as the popular Lovettsville Moms Facebook page are representative. But there were some critics, too. Some bemoaned the rapidly changing character of the once largely rural town and others questioned whether the growth was sustainable, or even affordable. Some long-time business owners, while generally supportive of the town’s rapid growth, also have those concerns. Andy Ghuzlan, who opened Andy’s Pizza & Subs in 2008, and who recently signed an extended 11-year lease to stay put, said he fully supports the growth. He says it was his belief in Lovettsville’s long-term economic viability years ago that led him to open a second restaurant there. And while he believes it possible for the town to support an expanded base of eateries—he said he’s seen no detrimental impact on his bottom line from new restaurants in town—he is concerned about the lack of food diversity among them. Chef Jason Lage, who owns the upscale, farm-to-table-focused Market Table Bistro in Lovettsville, Market Burger in Purcellville, and is about to open a Mexican restaurant in Leesburg, said he supports anyone who has the chutzpah to enter the restaurant industry. Lage said because his restaurants are specialized in their approach to cuisine, that he, like Ghuzlan, isn’t being affected one way or the other by the arrival of new establishments. Lage makes one exception to his open-armed welcoming philosophy toward new businesses in Town, though. “I don’t ever want to see a fast-food chain restaurant here. That’s not what Lovettsville is about. And you can quote me on that,” he said, laughing. What about the Peruvian chicken place on Loudoun St?? I discovered Lovettsville around 3 years ago and go to a place outside of it. I actually see it now as Paradise lost like so much of Loudon is becoming. When you first drive into it and see the ticky tack Ryan Homes development adjacent to the old it strikes you as being so totally out of place and character. When they started the little strip mall I was also amused by it being so out of character but realized it was just as out of place as the Ryan Homes. The only that could make it complete would be both a Dollar General and a Dollar Tree with a Nail Salon and a Panda Express. I am moving to Loudon next year but to Old Town Leesburg so that I don’t contribute to the continuing decline of Loudon. Every business is mentioned except Minuteman Arms. Is there a reason or just a omission?